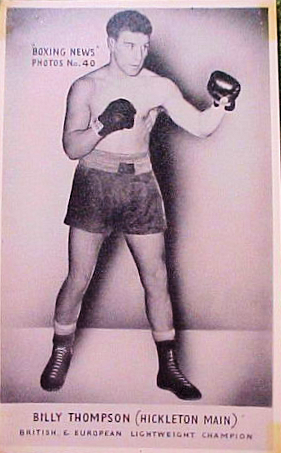 During the 1940s and 50s, Billy Thompson held the British lightweight boxing title from October 1947 to August 1951 and was also the European champion for almost two years. No mean feat in a time when bouts would be 15 rounds and happen almost every month. Born in New Silksworth, Sunderland in 1925, Billy moved to Thurnscoe with his family at an early age. He took up boxing as a schoolboy, becoming a national champion at 13. He won the Northern Counties ABA flyweight championship and the Air Training Corps title while he was a member. In 1944 he won the ABA lightweight championship, beating Scotsman J Cassidy to secure the title. In 1945 Billy turned professional and kicked off his career with a win over Billy Cunningham after moving to the famous Solomon's Gym in London where he trained alongside a young Henry Cooper. He remained unbeaten in his first 20 bouts before suffering a points defeat to Stan Hawthorne, one of the few to beat him as an amateur, in a contest for the Northern Area lightweight title at Liverpool FC's Anfield stadium. Billy would have his revenge a little more than a year later as the two men met once more at Anfield, this time with the vacant British title on the line. An emphatic third round knockout gave Billy his first professional title at a most prestigious level.He picked up the moniker 'The Pocket Adonis' due to his impressive physique. The 'Pocket Adonis' fought numerous times in the Royal Albert Hall as well as Anfield and Parkhead stadiums. He won a Lonsdale Belt - which he was allowed to keep following two successful defences of his British title. He lived in Thurnscoe where they welcomed him home with pride after each fight. He worked at Hickleton and Houghton Main collieries and for most of his life he lived on Clayton Lane in Thurnscoe. During the high point of his career, Billy travelled over to America on the Queen Mary to meet world lightweight champion Ike Williams. Alleged mob involvement put paid to the contest and Williams would instead fight another opponent. Billy was still treated as a celebrity and ate as a guest on the captain's table on the Queen Mary. After a few more fights at welterweight Billy hung up his gloves at the age of 27. Legendary boxing commentator Harry Carpenter paid tribute in a birthday letter to Billy saying: "He was one of the men I most admired and enjoyed watching when I started out in the business of reporting boxing." He died in 2011 aged 83 at the Flower Park Residential Home in Denaby Main, the golden belt was displayed on his coffin at his funeral.